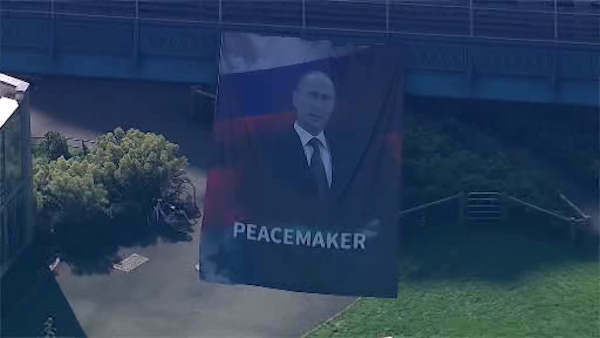 NEW YORK (WABC) -- Police are trying to find out who unfurled a large banner from the Manhattan Bridge Thursday with a picture of Russian President Vladimir Putin. The banner, with the word "PEACEMAKER" on it, appeared at about 1:45 p.m. and was removed by police about an hour later. The banner was hanging from the east side of the bridge under the Manhattan-bound lanes. Police will investigate who hung the banner on the bridge and why. NewsCopter 7 was over the Manhattan Bridge, where someone hung a banner of Vladimir Putin.